We had talked about this before but its worth while to mention about this again. Wirelessly stream live HD video from your PC to your TV. Warpia’s StreamHD adapter connects to your TV via HDMI cable. Across the room, a pre-paired dongle plugs into a USB 2.0 port on your laptop. The two devices communicate via Wireless USB, an Ultra Wide Band (UWB) wireless technology. And as long as the dongle and adapter remain within 30 feet of each other, you’re good for 32-bit True Color HD video at up to 1080p on your TV and Dolby Digital 5.1 surround sound audio. By way of comparison, Intel’s WiDi (Wireless Display) technology requires very particular hardware, only works with Windows 7 and is currently available on fewer than a dozen laptops. For full-screen streaming 1080p video, StreamHD needs your laptop to have an Intel Core2 DUO 2.4GHz with 2 GB of memory. Either way, it works with a larger variety of laptops running Windows XP, Vista and 7. Video Projector for iPhone for $299.95! 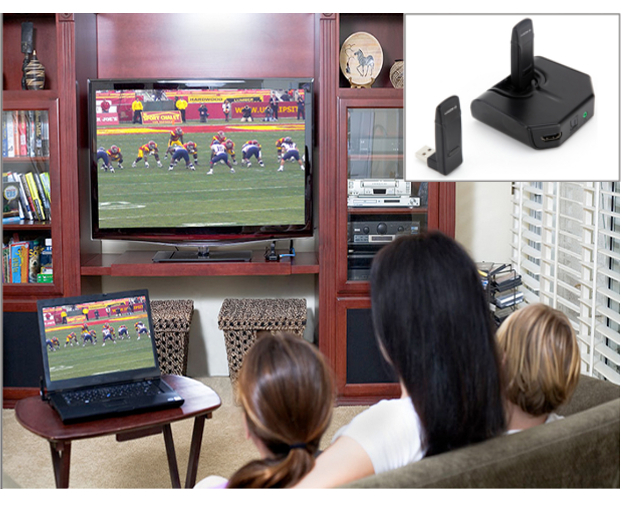 Amazing technologies of Wirelessly stream live HD video with which we can watch anything from pc or laptop to tv in large form.